Choosing a piece of equipment like a mini circular saw can be difficult and choosing the best mini circular saw to buy is even more taxing. In the post we breakdown all the main pieces of information you need to know in order to choose which mini circular saw is best for you and your project. There are many different types of mini saws and some of them are only suitable for certain tasks. It seems like a give and take situation when you’re trying to decide on just the right one. The reviews below will help you make a decision and educate you as to what types of tasks different mini circular saws are good fitting for your projects. Once you know what you will be using the saw for, you can decide on the best mini circular saw. 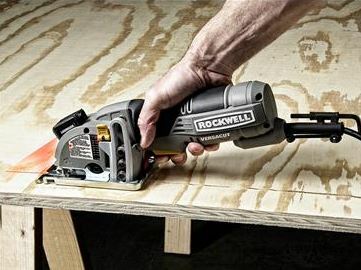 The first mini circular saw review listed is made by Rockwell a trusted brand in the construction and home improvement industry. The saw is durable, solid and can perform in many different work situations while others aren’t as versatile. The other mini circular saws are good choices and a few are very similar. While others like the Craftsman MasterMind are excellent choices, they may be more suited for certain types of jobs. 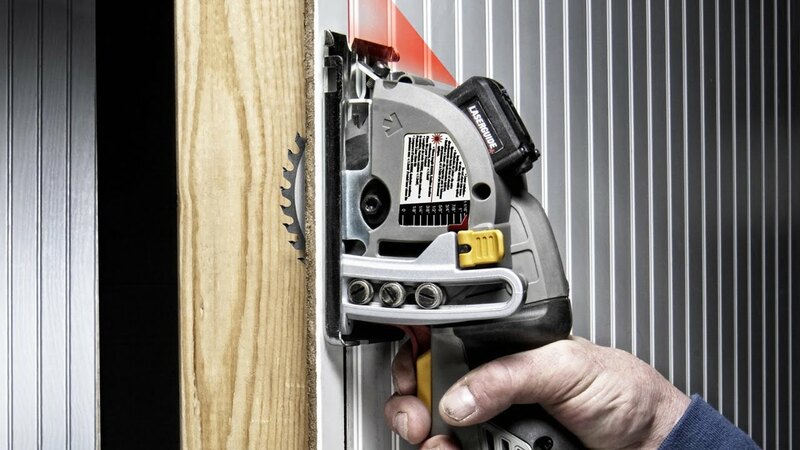 The Rockwell RK3440K VersaCut wins for the best mini circular saw. This mini saw packs 4 amp power from a professional grade motor that gives up to 3500 RPM. This means you can cut through steel tubing, hardwood, concrete, siding and more without bogging down or stalling. The top mounted laser cut guide shows users the upcoming cut path of the saw, helping to insure a clean and straight cut. The plunge cut indicators show exactly where the cut will begin, to help stop mistakes. The ergonomically designed handle makes working with the RK3440K a pleasure because it fits you’re your hand comfortably and naturally. The saw only weighs 4 pounds, so isn’t tiring to use. The mini saw is well balanced and combined with the grip and light weight, shows how much care Rockwell put into its planning. The saw has a maximum cut depth of 1.15 inches at 90 degrees and a blade diameter of 3.4 inches. Plunge cuts are possible up to 1 and 1/16 inches. An easy to reach and use depth control lever lets users change cut depth and lock it quickly. The dimensions of the saw are 18.4 x 12.5 x 5.4 inches. The all metal blade guard provides safety and a flat stable rest, but needs a firm hand to push down and start the cut. This is a good safety feature, but some users prefer an easier way. All in all the Rockwell RK3440K VersaCut mini circular saw gives users a very versatile, useful and attractive cutting tool. 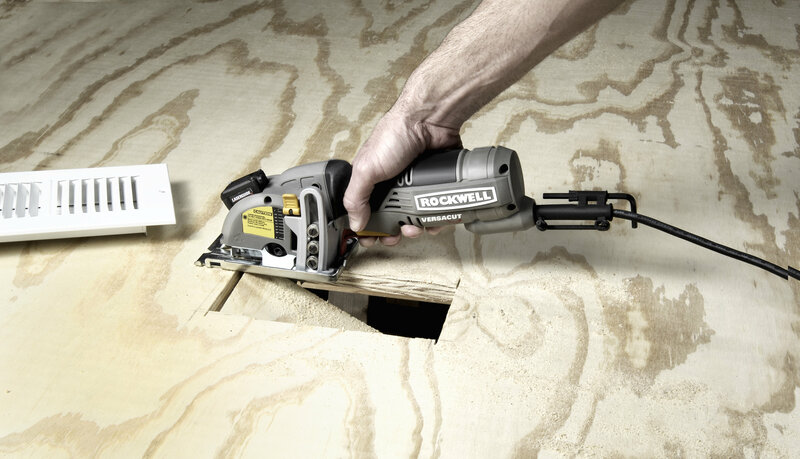 If you’re looking for the best mini saw, you found it in the Rockwell RK3340K. A quality runner-up to the champ in the “small circular saw reviews” is another Rockwell tool. The Rockwell RK3441K Compact Circular Saw Kit will match the cutting of the larger and more traditional circular saws due to its strong 5 amp motor and 3500 RPM speed. A 10 foot power cord provides the needed electricity and is a decent length from a power tool. The mini saw gives a maximum cutting depth of 1 1/16 inch at 90 degrees and 1.125 inch at 45 degrees. The 4 inch blade is smaller and narrower than the full-size counterpart and can perform nearly the same cutting tasks with less motor wear. The RK344 mini saw weighs about 5 pounds, is easy to control and use due to the shape of the grip. There is a handy dust extraction port and a 1 1/4 inch hose adapter for keeping a clean work space. This mini saw’s dimensions are 18.2 x 4.2 x 6.9 inches, making it small enough to use and transport easily. 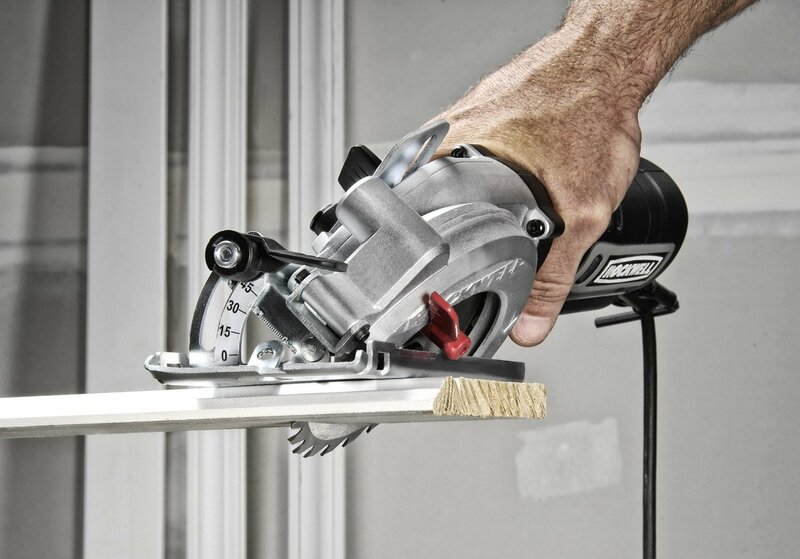 This little circular saw packs a punch with its high torque motor that runs at 3700 RPM. The BDCCS20B has a maximum cutting depth of 1.625 inches at 90 degrees and a cutting depth of 1.375 inches at 45 degrees. The tool free depth of cut feature means that adjustments are easy. The saw dimensions are 14.1 x 8.2 x 8.9 inches and it weighs only 6 pounds. The saw is easy to use because it is so compact and visibility is good because of it. The saw is 20 volts and runs on the whole Black and Decker 20 volt power system. The power source is a lithium battery that is not included in the saw purchase but again its a must for small circular saw reviews list. This is one of the smaller saws to make this list and is a good choice for people who need a small and light saw that can still cut. It is light and weighs only 3.3 pounds and has a total length of 11 3/4 inches. The product dimensions are 12x8x8 inches. It is equipped with a blade of only 3 3/8 inches size. The cutting depth is 1 inch at 90 degrees and 5/8 inch at 45 degrees. The saw’s power is a 12 volt lithium-ion battery that delivers a no load speed of 1400 RPM. The saw features a soft grip handle and a blower to clear the cutting path, making this an easy to use saw. An added plus to the Makita cordless circular saw is the 3 year warranty that Makita gave it. Last but not meant as least is the Craftsman MasterMind 800344 precision cutter. The motor provides 2800 RPM and can handle cutting many materials used in building, up to 7/8 inch thick and 3/8 inch thick for tiles. The saw is extremely useful because of its plunge cutting ability and adjustable depth control. The laser guide helps ensure a straight cut and it has a LED light for dark situations; which can be very useful on many worksites. The handle is ergonomic and can be adjusted into 3 positions. It weighs 9.2 pounds and measures 18.5 x 14.2 x 5.5 inches and has a vacuum hose adapter. These 5 mini saws all have a good amount of high customer reviews and are deemed to be good choices for a mini circular saw. While everyone has different needs and preferences, these are solid performers from reliable brands. When all is said and done, only the user can decide what saw they feel is the best for their own personal use. 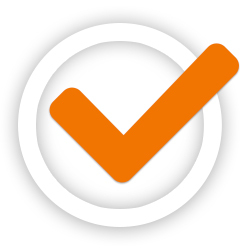 We hope that these the list of compact circular saw reviews has helped you on your search. What do you think is the best mini circular saw? If none of these mini saws are top quality to you, please tell us which are. We are open to listening to what other experienced people like yourself. If you decide that none of these tools are top quality, please let us know what you consider to be the best mini circular saw for cutting wood, laminating flooring, or cutting plywood are in 2018. Woodworking is not the easiest task so we want our readers to use the most useful, helpful and affordable circular saws on the market. Leave a comment below.